Why don't they start banning the sales of these snakes to people. They belong in the wild. Like all animals, they are the ones who suffer because of stupid humans. Well put,Joycey! I see no reason for anyone to own one,when in reality,they own you.They have the power to kill at will. Agreed they need top put a stop to these exotics coming in and being sold, it must be BANNED TOTALLY... and a ;aw brought in... jail sentences and fines... Yes they have to get rid of these exotics in the wild as it can be devasting on the environment as htey start competing for food..
Once again-animals are paying with THEIR lives because of the stupidity and greed of humans...DISGUSTING!!! I agree with Joycey, Chaz and Laura. The only responsible of the boy's death are those people that decided to have a python as a pet and then let it go, and, of course, those unscrupulous that sell them. Now that a tragedy took place human cruelty is directed towards the reptiles... Morons!!! Again humans wanted exotic animals until the animal became too big or powerful to control. people need to start using thier heads and realizing that most EXOTIC animals are meant to be wild and can never be safely or humanely owned. it is a disgusting shame this snakes have to be destroyed. 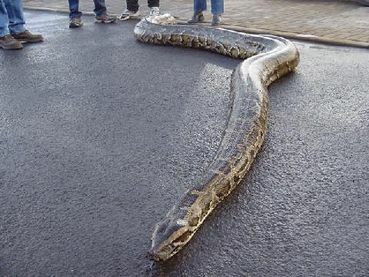 i know i would be terrified if a 8 ft snake was in my yard. i just wish there was a way to take them to a place where they could be set free. of course too much time, money and its too humane so it is faster, cheaper and more satisfying to simply slaughter the snakes. Huge outpoint. Why are the animal rights groups even talking killing humanely? Why not ship back home! No wonder we have endangered species. The animal rights are for the killing. The importing of so called exotic pets should be banned.The troube lies with people who purchase dangerous foriegn animalsand do so with a complete ignorance of these animals many of whom grow to an enormous size.When this happens they then release it into the wild without any concern either for the welfare of their now to big pet or the wildlife that has no defence against these predators.The also give no thought to the danger they place other peoples pets or indeed their children in.Theer was a case in the UK only last year about the mysterious lack of fish in an English lake and the fact that farmers were complaining about the dissapearence of some of their lambs over a period of 18 months.It was decided to drain the Lake and Hey Presto ! what did they find a seven foot crocodile.A completely insane act in releasing this animal into a public waterway.The question I ask is why was this animal on sale in this country at all?.The BBC did a survey after this discovery around pet stores in various citiy's and found that even pet store owners were completely ignorant of the needs of the animals they were selling !! !.I ask you.